For students who are interested taking their love of dance to exciting, new levels, Trilogy Cultural Arts Centre provides its students the opportunity to become a Company dancer. Company members will experience an advanced level of dance education, teamwork with other company dancers, multiple performances and some friendly competition. Dancers will devote more hours in the classroom practicing technique and learning advanced skills. Enrollment in Ballet and other classes*, as determined by level and company, is mandatory. Dancers must be in upper level Ballet classes. In addition to their weekly leveled ballet requirements, dancers will have Company rehearsals on Saturdays, 12:00-2:00 pm. Dancers must be enrolled in leveled Ballet and Jazz classes. In addition to their weekly classes, dancers will have rehearsals on Fridays, 4:00-5:30 pm. * Full list of requirements will be available at Company auditions. 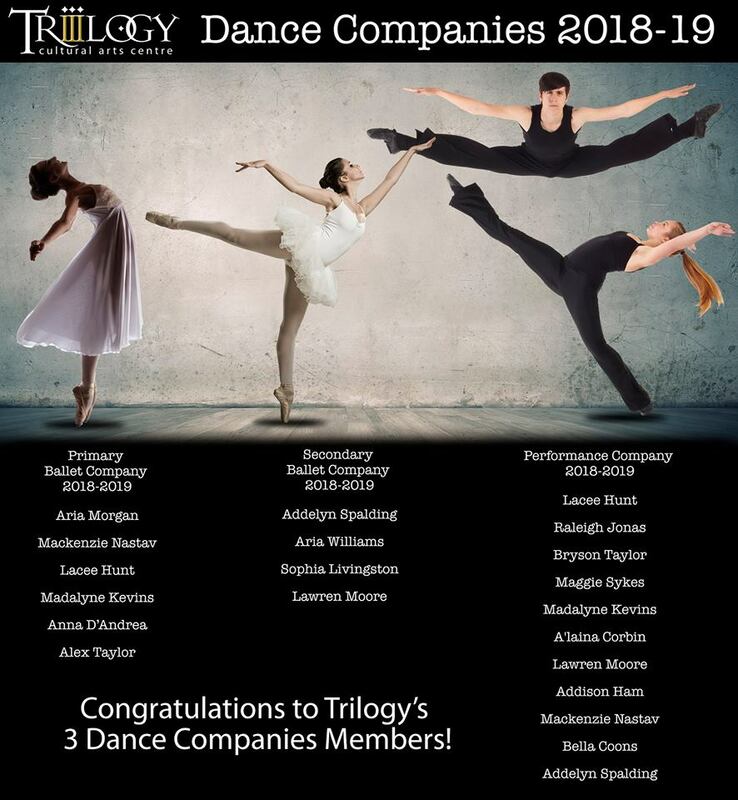 Company dancers are the core cast members of Trilogy’s two annual main stage dance productions: The Nutcracker Sweet (December) and the spring dance show (April). Participation in both is mandatory. In addition to our winter and spring dance productions, Company members will have multiple training and performance opportunities. Mandatory and optional participation varies by Company. This is an exciting opportunity for our Trilogy Company members! Dancers experience a full day of dance classes, training and instruction in Ballet, Jazz, Hip Hop, Lyrical and more with some of the top teachers and dance professionals from around the country. Visit the Talent on Parade website to learn more. Mandatory for Musical Theatre Performance Company; Optional for Ballet Company. Trilogy’s dance companies will perform on the Worlds of Fun stage during its fun and festive WinterFest celebration. Then dancers and their families can enjoy an evening of rides, holiday entertainment and lots of hot chocolate! For more details, click here. Mandatory for Musical Theatre Performance Company; Optional for Ballet Company. In January, our company dancers have the opportunity for a full weekend of training in all styles of dance with world-renown teachers and professionals from across the country. Opportunity to compete one of our Nutcracker pieces for adjudication. Open to soloists, as well. For more details, click here. Optional for all. All companies will perform on Times Square in NYC, see shows and tour NYC! Optional for all. All companies will compete for adjudication and placement at this fun competition, designed to be an educational learning experience for dancers with positive feedback they can use to improve their technique and stage presence. Afterward, dancers enjoy the day at Worlds of Fun. For more details, click here. Mandatory for all. Members of any of our dance companies may compete a solo at selected dance competitions. Dancers of any level will have the special opportunity to be in the spotlight and “own the stage.” This is a tremendous opportunity for individual attention and one-on-one dance instruction. Optional for all.